Reason for Reading: Received a review copy of the 20th Anniversary Edition. In Outlander, a 600-page time-travel romance, strong-willed and sensual Claire Randall leads a double life with a husband in one century, and a lover in another. Torn between fidelity and desire, she struggles to understand the pure intent of her heart. But don't let the number of pages and the Scottish dialect scare you. It's one of the fastest reads you'll have in your library. 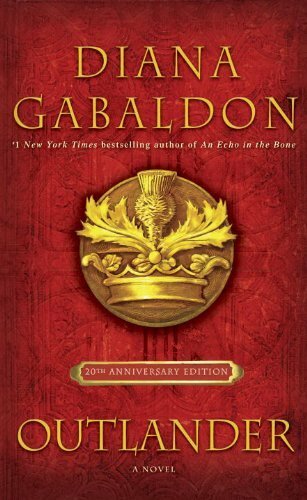 While on her second honeymoon in the British Isles, Claire touches a boulder that hurls her back in time to the forbidden Castle Leoch with the MacKenzie clan. Not understanding the forces that brought her there, she becomes ensnared in life-threatening situations with a Scots warrior named James Fraser. But it isn't all spies and drudgery that she must endure. For amid her new surroundings and the terrors she faces, she is lured into love and passion like she's never known before. I was lame and sore in every muscle when I woke next morning. I shuffled to the privy closet, then to the wash basin. My innards felt like churned butter. It felt as though I had been beaten with a blunt object, I reflected, then thought that that was very near the truth. The blunt object in question was visible as I came back to bed, looking now relatively harmless. Its possessor [Jamie] woke as I sat next to him, and examined me with something that looked very much like male smugness." 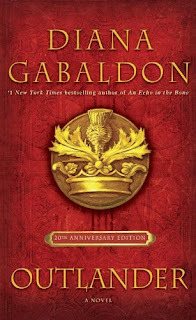 Gabaldon creates characters that you'll remember, laugh with, cry with, and cheer for long after you've finished the book. Another reread! I don't reread a lot, so this is impressive. I had the chance to get the 20th Anniversary edition of this book from Random House Canada, so I decided now was the perfect time to revisit the book. I originally read the book back in 2006 and posted a review. That means it has been just over 5 years since I read the book last. I enjoyed my experience with it once again. It is not my normal sort of read to begin with, but there is enough other elements that I enjoy. I still have never read on in the series. I thought maybe after finishing the book for the second time I would feel compelled to; but I still think the first book ends satisfactory and have no burning desire to read on. I am not even sure if there is much point saying much about this book. It has been around for 20 years and I have heard my fair share about it. I was happy to discover through my reread that while I remembered the basics of the story, there were still things that I felt like I was reading for the first time. I also had a different experience with the book this time. The first time I read it, I wasn't entirely sure what I was getting myself into. I am not a big fan of romance novels and that is pretty much what this is. I was a bit intrigued by the historical aspect, though, and the idea that there was time travel. This time, I knew that I loved it before and I was a bit worried it wouldn't hold true this time around. I am happy to report that I loved this book all over again and am excited I will have the 20th Anniversary Edition to read again in the future. If you are one of the about 10 people that haven't read this book, you really should give it a try. It makes me wish I reread more often, but I know that will only last until I see a new book and my attention is drawn off into that direction. I still might read on in the series one day, but I am happy to have just read this book and loved it as much as I did. My thanks to Random House Canada for sending me a copy of this book! You can read an excerpt from this book here. Even though I have already bought two copies of this book, and read it twice, I am seriously tempted to buy this anniversary edition. Do you think that the extra content is worth splashing out on? I loved this book. Like you, didn't think it was my type of thing. But I feel in with Jamie. I adore time travel and along with the history in this series, I rarely got bored. I've read all in the series. I do feel that some the latter book would have benefited from more editing. But still fun. I'm one of the ten people who haven't read this! Not sure why, as I'm sure I'll love it. I definitely one of the 10, and until this new anniversary edition brought out a bunch of conversation about it I had no idea what this book was. My erroneous idea any time I heard about it or saw it sitting on the shelf was that it was some sort of Clan of the Cave Bear type book. Not that Clan of the Cave Bear is a bad book (I don't know) but I never felt like it was my sort of thing. Anyway, am much more interested since reading more about it. Cool that they put out a 20th anniversary edition. If nothing else those who love it can get a nice hardback copy of it for their collection. I haven't read this book, but I managed to snag a copy at a book swap last year. Glad to hear I shouldn't be worried about it dragging given its length. I didn't realize the anniversary edition came with extra stuff. I'll have to take a look at it next time I'm at the bookstore. If you ever do decide to read on in the series, the others are really, really good! DRUMS OF AUTUMN is my favourite. The first three hundred pages are just average, but the last seven hundred are made of so much awesome that they totally compensate for the slow opening. **Midlife Jobhunter: I know what you mean. I really enjoyed the character of Jamie and Claire was not what I was expecting at all! **Alex: It's crazy it has been that long and the series is still going strong! **Random House of Canada: Thanks! **Anna: It is really good! I hope you get a chance to read it and enjoy it. I think you need to at least read the next couple of books Kailana! **Marg: Probably... I will get there at some point! Someday I will have the time to read this...and George Martin...and everything else!!!! Wow, it's twenty years old--my how time flies! I read this maybe fifteen years ago and really liked it as well--pure page turning fun. Time slip stories can be hard to do, but she did it well. I read the next two in the series, all fairly close together, but then I think I needed a break and never went back to read another. At this point, I think I'd prefer to reread the original. Glad to hear it stands up well to the test of time and memory! **Danielle: Time flies! I should really read on in the series, but the first book was good. I am apparently one of the 10 people who haven't read this book! I have it; just need to read it. Glad to hear it held up to a re-read. **Terri B.: I hope you enjoy it when you get a chance to read it! Aw shucks. I'm going to have to read this.